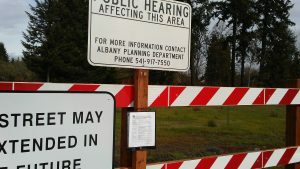 As the sign says, a public hearing on the zone change north of Pleasant Way will be held March 6. A proposed zone change would allow a 12.7-acre tract of woodlands and vacant land in North Albany to be built up for a wide range of uses, but the applicant says he is thinking along the lines of attached housing for seniors and families. The property lies off the north end of Pleasant Way, a new street that leads past an equally new Samaritan Health building on the north side of Hickory Street and then stops at a red-and-white barricade. On its east side, the land backs up to the yards of nine houses on Troon Street. The northern property line is the Union Pacific track used by the Portland & Western Railroad. Winkler Development Corporation and architect Michael Roberts, both of Portland, are seeking the zone change from “residential medium density” (RM) to “mixed-use commercial” (MUC). The Albany Planning Commission will hold a public hearing at 5:15 p.m. Monday, March 6, at City Hall. If it approves, the request next goes to the city council for another hearing on April 12. Only the zone change is at issue now. The applicants have proposed no specific development. But I reached Jim Winkler, the principal in the development company on Tuesday afternoon. He told me he was exploring various concepts but was leaning toward what he called senior and family attached housing. In any case, it would not be a shopping center, even though the zoning he seeks would allow one. Winkler is asking for the zone change because it would allow greater flexibility in development than the present designation. The MUC zoning has lower parking requirements, and he’s interested more in transit-supported housing. The site, near health-care offices and the new supermarket being planned by The Myers Group in the former Ray’s space, is unusually attractive to seniors, in Winkler’s view. If the rezoning goes through, Winkler says construction would start about a year from now. The property became part of the city when Albany annexed North Albany in 1991 and was zoned for apartments. 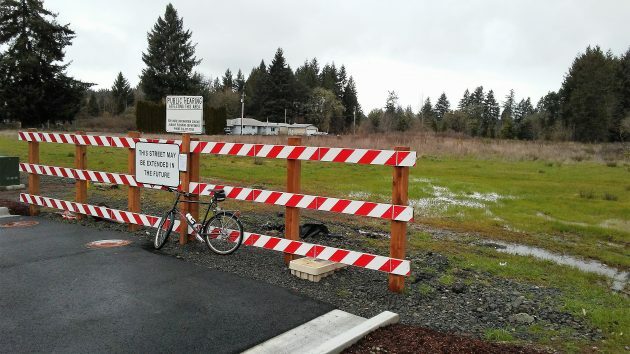 A subdivision approved in 2005 included the property, but a final plat was never filed. In 2007 the land was rezoned medium-density residential (RM) as part of the city’s adoption of the “village center,” a land-use concept that allows many uses to be intermingled. In order to avoid triggering requirements under the state’s transportation planning rule, the applicants have agreed that any uses of the site would generate no more traffic than the 192 additional afternoon peak-hour trips that would be caused if the land was developed for the maximum 317 multifamily units that the present zoning allows. Theoretically, under the proposed zoning the land could be turned into a shopping center that would generate 491 peak hour trips. But the “trip cap” based on existing zoning would prevent that. The mixed-use commercial zoning district (MUC) allows, among other things, small-scale manufacturing, entertainment and recreation offices, restaurants, most retail and service businesses, nightclubs, vehicle services, residential care and treatment facilities, assisted living, apartments, and single-family houses. Tags: Jim Winkler, North Albany rezoning, Winkler Development Corp. So, the first shoe has dropped. Somebody may have money to spend for development. By the way folks, I lived in a town that rejected outside development and became a carbuncle. Nearby town embraced development and prospered. Well, james you seem not to understand the process. The mayor doesn’t make the decision but rather the planning commision and the city council. And they are bound by the city development code. You will have ample opportunity to provide civil public comment on the upcoming hearings. So you have a chance to stand up and rant in public if you please.